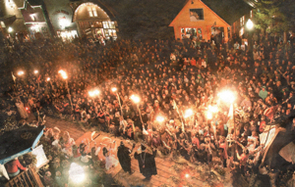 "Never pass up an opportunity to Celebrate"
AND AUTUMN EQUINOX CELEBRATION IN CRESTED BUTTE, CO. This one-of-a-kind Harvest Festival was created 25 years ago by Marcie and the elders of Crested Butte. It honors the ethnic backgrounds and traditions of the original homesteaders and miners of the Gunnison Valley and features a week of storytelling, Medieval costumes, feasting, music, dancing and performances in the village streets. A truly grassroots, Celtic and European Festival! 9/13, 9/14 Join Marcie for two evenings of MAKE YOUR OWN STORIES WORKSHOP. Learn how to develop personal stories of humor, discovery, adventure, wonder and transformation into performance-ready quality. 9/15 Join Marcie for “Old-Timers, Originals, Ranchers and Miners Storytelling” at the Heritage Museum of Crested Butte. 9/16 Join local famous and infamous folk for “The Vinotok Liars’ Contest” at the Eldorado. Marcie will tell the Vinotok Story and introduce this year’s lusty and dashing Green Man, selected by the maidens of Crested Butte. 9/17 Join Marcie at the Depot along with local poets, storytellers, fire-spinners and celebrants at the ALL-COMMUNITY VINOTOK FEAST. Bring your own potluck dish to share and dine on all-organic, local produce, wines, beers and traditional dishes from Crested Butte ethnic heritage. 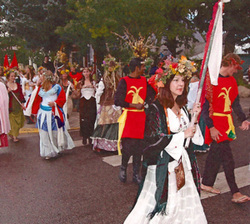 9/18 Gather at 7pm in the center of Crested Butte, at 3rd and Elk Avenues for the VINOTOK PROCESSION, STREET THEATRE AND BONFIRE. Join the Vinotok Characters, Harvest Mother, Green Man, Morris-Dancing Maidens, Lusty Lads and Torch-Bearers, Earth Dragon and Sir Hapless as we go mumming. We will be singing, dancing and drumming through the restaurants and pubs to draw you out into the street! Listen as Marcie tells the story of the Autumn Equinox, the balance of Dark and Light, Feminine and Masculine, Life and Death, Summer and Winter. Write your “Grumps” on pieces of paper, list everything you would like to release and banish from the passing year. Stuff them into the 20-foot effigy, “The Great Grump.” He will stand trial as the Magistrate brings him before the entire, gathered village. Watch as the Green Man is presented to the community and the very-pregnant Harvest Mother celebrates the children and a new year of hope to come. Then, follow the music, the torches the dancing, singing lads and lasses to the crossroads where the Great Grump shall be burned in the giant bonfire. Join 2,000 villagers as we celebrate the turning of the seasons, the harvest of hearts and home and generosity of spirit to carry us with blessings into the winter snows!